A historic steam locomotive restored at a cost of £200,000 after it was saved from a scrapyard has hauled its first passenger train in 43 years. The Great Western Railway 0-6-2 Tank No 6695 - built in Newcastle in 1928 - has been restored by volunteers since its rediscovery in Wales in 1979. It finally hauled its first passenger service since 1962 on Saturday. 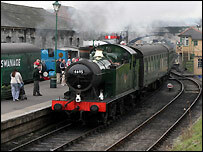 Nicknamed the "Taffy Tank", the locomotive travelled from Swanage to Norden in Dorset. The locomotive, which was rescued from the Barry scrapyard in south Wales and brought to the Swanage Railway in August, 1979, will now regularly run on the popular tourist route. It was built in Newcastle-on-Tyne by Armstrong Whitworth for the Great Western Railway in 1928 and spent its career working in the Midlands and south Wales. 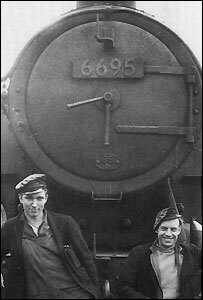 The tank locomotive ran more than 620,000 miles before being withdrawn for scrap in the summer of 1964. It had hauled its last freight train earlier that year but had hauled its final passenger train two years earlier, in November, 1962, in the Rhonda Valley. Nigel Clark, of the No. 6695 locomotive volunteer group, who lives in Poole, said: "It is great to see the locomotive haul its first passenger train since 1962 - it was quite a moment. "When we brought her to Swanage in 1979, I never thought she would take this long to restore but everyone has done a brilliant job. "It has taken a lot of hard work and determination to complete because we had to battle against the problems of working in the outdoors, raising money, restoring parts or having them made from new."